In June of 1889, Vincent Van Gogh painted his view of the pre-dawn sky from his room in the Saint-Rémy-de-Provence asylum. He had voluntarily admitted himself after cutting off his left ear. In 1941, Andrey Kolmogorov proposed a new mathematical solution to the problem of turbulent flow and how it works. Turbulent flow, or turbulence, describes the dynamics of fluids with regards to the rapid variation of flow velocity in space and time. It has yet to be fully explained by mathematics, but Kolmogorov has come closer to doing so than anyone else. While turbulence is an exotic physical process to try and pin down with numbers, many people experience its effects every day. When an airplane encounters two masses of air moving at different speeds, the pilot will warn the passengers that they are about to run into some turbulence and instruct everyone to fasten their seatbelts. Huge pockets of swirling air will jostle the airplane up and down. To view turbulence in nature, one need only look at a body of water and notice how it swirls and churns when the water flows at different speeds. On a much grander scale, the atmospheric bands of Jupiter, specifically the Great Red Spot, depict Earth-sized areas of turbulence. Or one can simply look at Van Gogh's The Starry Night. Recently, when physicists examined Van Gogh's work, they found something remarkable. 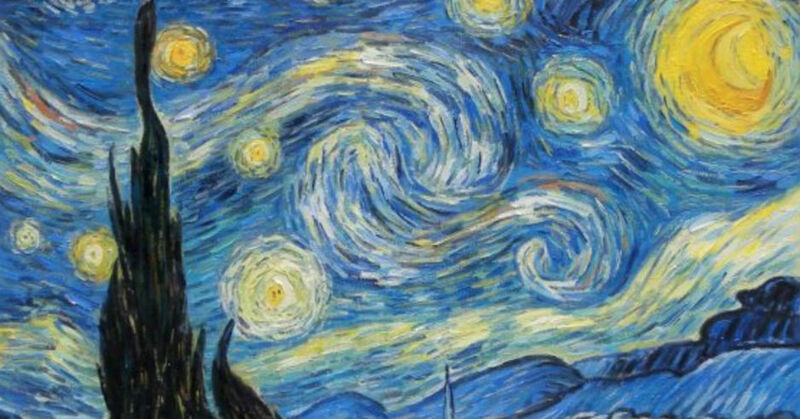 They discovered that there is a distinct pattern of fluid structures which are nearly identical to Kolmogorov's equation found in Van Gogh's sky in The Starry Night. This pattern is not found in works he created when not in periods of mental distress; only in periods of great mental anguish was Van Gogh able to illustrate one of the most complex processes in all of physics. Vincent Van Gogh transformed the chaos in his mind into beauty on the canvas. And, without any proper training in mathematics or physics, he was able to illuminate a concept which confounds physicists to this day: turbulence.